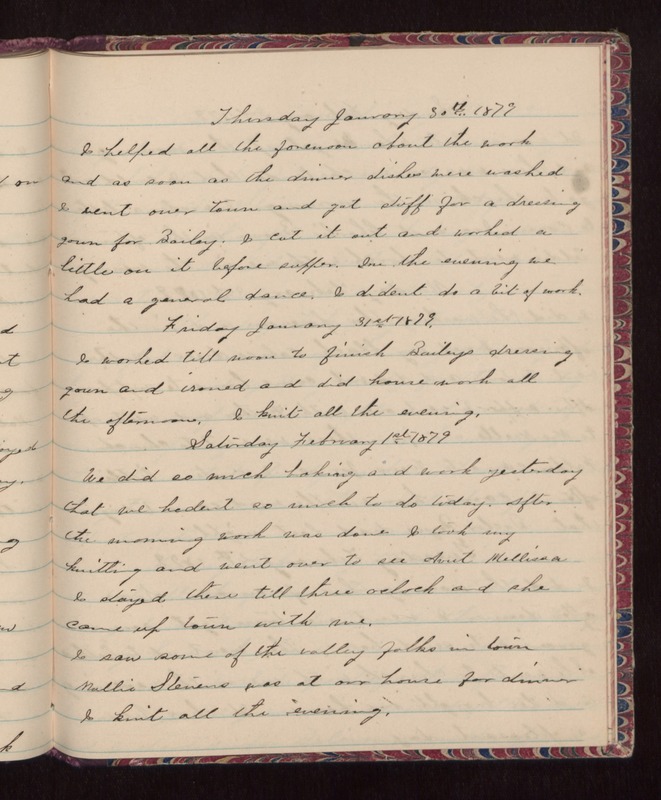 Thursday January 30th 1879 I helped all the forenoon about the work and as soon as the dinner dishes were washed I went over town and got stuff for a dressing gown for Bailey. I cut it out and worked a little on it before supper. In the evening we had a general dance. I dident do a bit of work. Friday January 31st 1879 I worked till noon to finish Baileys dressing gown and ironed and did house work all the afternoon. I knit all the evening. Saturday February 1st 1879 We did as much baking and work yesterday that we hadent so much to do today. After the morning work was done I took my knitting and went over to see Aunt Mellissa I stayed there till three oclock and she came up town with me. I saw some of the valley folks in town Mollie Stevens was at our house for dinner I knit all the evening.